"I met with a prospect who loved my presentation and seemed ready to hire us, but now he's gone silent. How can I get him to make a decision?" DON'T send an email follow-up that looks like this: "I'm just following up to see if you're still interested in hiring our cleaning company." It sounds desperate and does nothing to prompt them into action. DON'T send a follow-up email that says how interested you are in working with him or her. That isn't going to make an impression or get him or her to take action. Find a better reason to stay in touch, instead of sending desperate emails. Everyone talks about adding value by sending an interesting article you think your prospect might be interested in. Take it a step further and send them an article that YOU have written that demonstrates your expertise. And make sure it's a topic they'd be interested in or that is important to their business. For example, maybe there's a recent flu outbreak and you've written a blog post on how to prevent the spread of germs in an office setting. Mail them something of value. Our clients loved our monthly newsletter. And yes, we actually printed it out and mailed it to them. They are much more likely to open something that lands on their desk than they are to open an email newsletter, where it's easy to hit the Delete key. We also sent it to prospects that we really wanted to do business with. In our initial meeting we gave them a copy, and then continued to mail it to them. In one case, our prospect was in the early stages of building a 50,000 sq ft, Class A office building. It took several months, but instead of badgering them with phone calls, we stayed in touch with the newsletter. And we were the first ones they called when it came time to submit proposals. Think about what might make the timing of a follow-up meeting important right now. Maybe winter is just ending and you know their floors are in desperate need of professional cleaning. Give them a reason to be interested. You had them engaged in your first meeting, so find a way to re-engage them. Think back to what their issues are with the current cleaning service. For example, you could say something like, "At our last meeting you mentioned that you are tired of the soap dispensers running out of soap all the time. I have an idea on how to fix that problem." Remember, it's not about you; it's about your prospect's problems and how you can fix them. Find a client or colleague who can give them a nudge. LinkedIn is a great resource for finding common connections with clients and prospects. Maybe a current client who knows Mr. Prospect would be willing to put in a good word. Many of us are so used to text messaging instead of actually calling people, that we simply assume that everyone is ok with it. But before you start bothering your prospect with text messages, find out their preference early on. Sometimes the timing just isn't right. It doesn't necessarily mean they'll never hire you. We've had prospects contact us a year or more after our initial meeting, finally ready to make the switch. Check back in 6 months or so to see if you get a response. If not, let it go and put the ball in their court by letting them contact you when they're ready. Do You Make These Mistakes When Terminating Cleaning Technicians? Have You Ever Walked Away From An Opportunity To Make A Sale In Your Cleaning Business? Walking away from taking on a new client is not something anyone likes to think about because we work so hard to gain each and every one of our clients. And when you have a prospect that is ready to give you their business, why in the world would you ever say no? Why Walk Away From a Prospective Cleaning Account? Sometimes, walking away is just the right thing to do. Several years ago we had a medical clinic account where we did all the carpet cleaning and hard floor care. The surgery center that was affiliated with the clinic called us up one day and asked us to give them a price for cleaning their space. We met with them to find out more about their needs and found that they were practically ready to hire us that day because they trusted the fact that the clinic was very happy with our work. After walking through the space, we realized that if we were to take on the account we'd be getting in a little over our heads. You see at that time, we did not have enough specialized knowledge and training in cleaning a surgery center, and it would take time for us to get that type of training in place. But because we didn't feel comfortable in our ability to handle it at that time we decided to turn it down. It was the right thing to do for the prospect. Of course after that opportunity came along, we decided that this was a niche that we should become educated in, which we did over the next year. And that gave us the opportunity to re-connect with them in case they ever needed a new cleaning service. What it comes down to is integrity and making sure you don't place more importance on dollar signs over what is right for the prospect. Customers today want to to deal with credible people who will tell them the truth. If you're walking into a situation that requires more skill than you have, or it's a much larger account than you're prepared to handle, then do the right thing and walk away. Have you ever walked away from an opportunity like this? Please share your story by clicking on the Comments link below. Cleaning Affects Productivity: Are You Educating Your Prospects? Most company managers are focused on their day to day business activities that include acquiring new customers, managing employees, keeping expenses down, and increasing profits. All of these activities impact their bottom line. But few managers are aware of the enormous hidden costs they are paying for, by having an unhealthy work environment for their employees. The cost of healthcare today has a huge impact on a company’s bottom line yet managers don’t seem to be overly concerned with employee health, illness/injury prevention, reducing absenteeism and promoting overall wellness in the workplace. But what if someone were to quantify the benefits of a healthy workforce and provide definitive proof, connecting a clean work environment and a healthy workforce to increased productivity and a healthier bottom line? In a study of 400 managers and employees conducted by HLW International LLP, employees’ productivity levels were determined to be heavily influenced by the cleanliness of the office in which they worked. A clean office produced quantifiable results when it came to employee productivity. They reported a 5% productivity gain ($125,000) in a 100-employee office with an average salary of $25,000. Additional studies performed by the Minnesota Department of Health reported the following: Good housekeeping protocols that thoroughly removed dust from surfaces were found to have both health and comfort benefits. A Minnesota Department of Health (MDH) (Minnesota Department of Health, 2008) report regarding the impact of cleanliness on student performance in educational facilities also supports the theory that the average productivity impact of proper cleaning can range from 2 percent to 8 percent. According to a 10-month survey of more than 25,000 individuals conducted by Advance PCS Center for Work and Health (Bureau of Labor Statistics, 2002), off-task workers cost businesses an average of $250 billion a year, or approximately $2,000 per worker. The estimates were derived from their salaries and estimates of time spent at work engaged in reduced on-the-job performance because of illness. Cost impact was estimated by multiplying lost productive time (absence hours plus hours lost from reduced performance) by the individual worker's hourly labor cost. Research has shown that there is indeed a direct connection between a clean and healthy work environment and worker productivity levels. Companies may be experiencing low employee productivity due to a less than acceptable work environment without realizing it. This is where you come in. You can sell the value of your cleaning service by educating prospects on the importance of a clean work environment. Inform your prospective customers on how a clean work place can have a substantial impact on their employees’ productivity and can reduce their company’s health related costs at the same time. It stands to reason that a poor work environment means poor employee output. 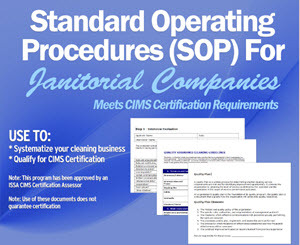 Instruct potential prospects that with the proper cleaning regiment, procedures, and quality control principals in place, you will save them money and improve their bottom line. Quote the statics and watch them take notice. We just had a discussion in the member forum about being financially able to expand a growing cleaning business. One member commented that his business is growing but he's concerned about the lack of capital needed to fund the expansion. For commercial cleaners in particular, this can be a real challenge as you get into larger sized buildings. There can be a significant equipment investment as well as large payroll runs as soon as you take over the new account. If you have your clients pay BEFORE service starts each month, it will help your cash flow immensly. But what if that is not quite enough? Another member joined the discussion and suggested getting a line of credit. The original poster said it goes against all of his thinking because he despises debt. I do see where he's coming from, because we were lucky enough to be able to self-fund our growing cleaning business. We had a little help from our janitorial distributor in the beginning, who let us pay for equipment over 90 days if we needed a little extra time. My response to our member who is averse to debt, was to suggest that he look at a line of credit in another way. "Don't look at a line of credit as debt. Look at it as building credit and building a relationship with your banker. We had a $30,000 line of credit that we didn't necessarily need. But every time we made an equipment purchase that was $2000 or over, we used it, even if we could afford to pay cash. We simply made the monthly payments until it was paid off. That helped our corporation establish its own credit - in case you ever really DO need it." If you are struggling with how to fund the growth of your business, consider the three options suggested above. It just might make it a smoother road to growth! Are you confused by the title of this blog post? How can you expand your client base by eliminating prospects? Doesn't it make more sense to increase the number of prospects in your database? After all, it's supposed to be numbers game - the more prospects you have the more clients you should be able to gain. The problem is, many of the prospects you're thinking about working with are BAD PROSPECTS for your business. Unfortunately we learned this the hard way, so maybe we can spare you from making the same mistake. Back in the 80's when I was transferred out to Idaho for my retail management job, Steve followed me and went to work in construction. Fortunately, he was laid off from his job. Of course, at the time we didn't think that was such a great thing since we suddenly had to rely on my small salary to support the both of us. But after a few weeks time, the owner of the construction company that had laid Steve off, called him up and asked if he wanted a job cleaning several office buildings that he owned. He was tired of dealing with horrible cleaning companies and wanted someone that could take care of business. In just a few short weeks, we were able to turn Steve's full time cleaning job into our own business. In order to grow the business, Steve started looking around for additional cleaning accounts. He approached anyone and everyone he could think of. So we ended up cleaning office buildings, hair salons, an auto dealership, a bar, a restaurant, convenience stores, paint stores, and manufacturing buildings. There were a few more, but you get the idea - it was quite a variety. The problem came when we figured out that some of these accounts were a real pain in the you-know-what. The hair salons didn't have much of a budget for cleaning, so they wanted once a week service and expected miracles when it came to hair removal. Let me tell you, no matter how hard you try, you'll never be able to pick up ALL the hair. Restaurants and bars became problematic because they were either cleaned very late at night or very early in the morning. So it was hard to find employees that wanted to work those hours. And Steve was already working a lot of late nights, so early morning just didn't work. So we decided that enough is enough. No more searching for and taking on any type of cleaning prospect that came our way. Instead, we focused our time on seeking out the types of accounts that we loved to do, that fit well into our schedule, and that we could easily staff. Next, we trimmed the fat. And we did that systematically. As we gained a new "ideal client", we let go one of our clients that no longer fit our ideal client profile. This helped us maintain the income level we needed, while getting rid of the clients that were just not the right fit for us. So if you're in the mode of taking on any prospect that offers you the chance, I strongly encourage you to start focusing more of your time on seeking out the type of clients that you enjoy doing business with instead of allowing yourself to be sucked into an ill-fitting situation. Do YOU currently have clients that are not a good fit for your business? Tell us about it by clicking on the comments link below. The prospect went with someone else for their cleaning service. Darn it! I know they liked me, and it really felt like it was going my way. But they gave it to someone else! Instead of licking your wounds, I challenge you to ask yourself a few questions to figure out why you lost your last sale. Let's start with the easy ones. 1. Were you on time or were you late? The RIGHT answer is that you were at least 5 minutes early. 2. Were you organized? If you carry collateral material about your company, a measuring device, notebook, pen, tablet, etc. is it all organized so that you don't fumble around looking for things? 3. Were you prepared? Did you do your research so you weren't asking the prospect to tell you about their company? Remember, it's your job to know! If you called on a residential prospect, were you familiar with the neighborhood and the type of clientele that live there? Now ask yourself the tough questions. And be honest with yourself! If you don't pass muster with these questions, it's time to do something about it or you'll continue losing out to your competition. 4. Were you able to overcome all the objections confidently? If not, you have work to do. You should be prepared ahead of time for the objections you'll hear so that you have a confident response that will satisfy the prospect. 5. Did you feel as if you were on the defensive through most of the visit? If you find yourself always defending your price, the quality of your service, or other tough questions posed by the prospect, then it's time to work on your confidence level. If you aren't confident that your price is worth every penny, the prospect will see that as an opportunity to negotiate. And if you're not confident about quality control, employee longevity, or a host of other subjects, you'll probably find yourself on the defensive throughout the visit. This will NOT get you the client! 6. Did you appear desperate to make the sale? Too many people, especially those new to the business, are often anxious to make the sale. And the client will read that as desperation. They won't give their business to someone that is desperate for it. - How many clients do you have? - How do I know you'll show up when you say you will? - What if you get hit by a bus tomorrow? - How do I know you'll send me the same employee to clean every time? Even though you thought the sale would go your way because you got along with the prospect and they seemed interested, it's not enough. They need to not only LIKE you, they need to trust you and believe in you. And when you're confident in your ability to handle the job at a price that makes sense, then you've got a much better chance to close the sale. "What kinds of problems are you facing today with regards to keeping your building (or home) clean?" This is a good open-ended question that is likely to get them talking. It will also help you to direct the discussion to what you already know about the problems prospects typically face. Finding a cleaning service that doesn't have a revolving door of employees cleaning their office (or home). 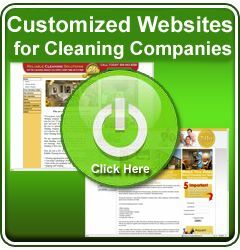 Finding a service that provides consistent cleaning services. They start out great but after a few weeks or months, the work goes down hill. Finding a cleaning service owner or manager that actually knows what's going on in our building (or home) and anticipates my needs. Which of these three issues is having the most impact on the cleanliness of your office (home)?" Can you see how combining a good, open-ended question can lead them into a discussion where you can showcase your understanding of their frustrations? When directing your discussion in this way it also shows the prospect that you work with other people just like him. And be sure to ask a related follow-up question, which will get you the more specific answers you're looking for. When you ask thought-provoking questions of your prospects and then follow up with what you already know from your experience with other clients; you're sure to make an impression on your prosect that will get him moving in the direction of becoming your next client. Are Your Referral Rewards Enough To Keep The Cleaning Referrals Coming? We all know that referrals can be a huge contributor to the growth of our cleaning business. Most of us would like to reward the people that refer new business to us, but I've seen these rewards run the gamut from sending a Thank You card to sending a gift card to giving hundreds of dollars in cash. Part of your decision on referral rewards is the size and quality of the referral. If you're a residential cleaning business that received a referral for a new home to clean, you might treat your referral reward a little differently than a commercial cleaning company that received a referral for an account that grosses several thousand dollars of income each month. When I speak to the quality of the referral I'm talking about whether or not the referral is a good fit for your company. You must educate your clients and networking buddies on what exactly is a good referral for you. Assuming you're getting good referrals, I would recommend at a minimum, a policy of sending a personalized greeting card along with a gift card to thank them for the referral, regardless of whether or not you picked up a new client. If a person goes out of their way to refer someone to your cleaning company, then you should go out of your way to say thanks. You'll be surprised at how this small gesture will build a stronger bond with your advocates. When it comes to gift cards, many people like to give a Starbucks gift card since it's a gift most people enjoy. But I'd like to suggest that you give more than a $5 or $10 card that will buy one or two fancy coffee drinks. Instead, give a card with at least a $25 value so that they can use it several times. Each time they use the card they'll be reminded of who gave it to them.This happened to me one time when I gave a referral and when my card ran out I thought to myself, "darn, now I have to start paying for my coffee again." This alone can be incentive enough for them to give you ongoing referrals! What are your thoughts on this topic? Do you give referral rewards that keep the cleaning referrals coming? Click on the comments link below to share your ideas. P.S. If you want an easy way to send a personalized thank you card with Starbucks giftcard in just minutes, check out CardsForCleaners.com. No need to go to the store to buy the card and then stop by Starbucks to buy the gift card -- you can do it all in one step online! Price Versus Cost - Is There A Difference When It Comes To Cleaning? These days prospects tend to focus on the price of your cleaning service over everything else because they want the best deal to stay within their budget, while still getting a quality service. But it's your job to help them realize they should be thinking about COST, not PRICE. What your prospect doesn't realize is that the cost of hiring a quality service provider isn't about price. It's about the cost of NOT hiring a quality service provider. Every time work has to be redone the cost of quality increases. An obvious example is the prospect having to spend the time contacting the cleaning service to re-clean an area that was missed. It takes extra time out of their day and causes extra stress they don't need. Often times, this added stress is the price they pay for hiring a low "priced" cleaning service. Help your prospect realize the cost involved in hiring a low "priced" cleaning service. What typically happens in this situation is a few months down the road the prospect ends up having to take the time to find another cleaning company because of the poor quality of work provided by the current company. The owner of the low priced cleaning service inevitably discovers that they can't make a profit at that low price so they start hurrying to get the job done, or cutting corners in order to squeeze out a profit. If you can help the prospect understand that the low priced cleaning service will cost them more in the long run, then you'll be one step closer to gaining a new client. Cleaning Business Owners - Are You Asking Powerful Questions? We often try to anticipate the questions our prospective clients will ask us. But how many people make a list of powerful questions to ask prospects? What if you turned the tables and asked them questions they've never been asked before? Watch this video from Jeffrey Gitomer and tell us what you think by clicking on the Comments link below.